The U.N. Intergovernmental Panel on Climate Change, or IPCC, released the final draft of its Working Group III report, which presents trends in emissions and evaluates mitigation scenarios. The report, titled “Climate Change 2014: Mitigation of Climate Change,” finds that global greenhouse gas, or GHG, emissions increased steadily from 1970 to 2000 and then more steeply between 2000 and 2010—1.3 percent versus 2.2 percent per year. It also finds that achieving some measure of climate safety will involve a dramatic global rise in low-carbon energy—of three to four times the share of low-carbon energy in 2010—and a dramatic global fall in GHG emissions—of 40 percent to 70 percent from 2010—by midcentury. According to the procedures of the IPCC, the report’s summary for policymakers was subject to line-by-line approval by IPCC member countries before its release. Comparison of the summary to an earlier draft that was leaked to the press shows that member countries deleted or modified several paragraphs and figures. Information lost in the summary remains in the body of the 16-chapter document; the summary, however, is the most visible part of the report. One of the most conspicuous cuts was to the categorization of countries according to income. The summary previously contained figures and text that sorted countries into four groups—high income, upper middle income, lower middle income, and low income—in order to disaggregate data and reveal trends. According to sources close to the proceedings, Saudi Arabia objected to the use of these categories and was backed by countries including India, Qatar, Iraq, Egypt, Venezuela, Maldives, Syria, and Sudan. When the U.N. Framework Convention on Climate Change, or UNFCCC, was established in 1992, it made a distinction between developed countries—Annex I—and developing countries—non-Annex I—in recognition of the fact that industrialized countries then led the world in historical and current emissions and, consequently, had the responsibility to lead in mitigation. The global emissions landscape has since changed. China, for example, now leads in carbon emissions—followed by the United States and India—and is gaining in historical emissions. As mitigation efforts across the annexes are now necessary for climate stabilization, the parties to the UNFCCC decided in 2011 that the international climate agreement to be struck in 2015 will be “applicable to all Parties.” This is in notable contrast to the Kyoto Protocol, which was struck in 1997 and set binding mitigation targets for only industrialized countries. Saudi Arabia and other parties may fear that including the more refined income-based groupings in the summary would make it easier for Annex I countries to shift some of their responsibility for mitigation to non-Annex I countries that have sizable emissions and financial capacity. These might include, for example, Saudi Arabia, a high-income country; China, an upper-middle-income country; and Brazil, an upper-middle-income country. The tension around the classification of countries and the assignment of responsibilities for mitigation that may be implied reveals a key fault line in the negotiations in the run-up to 2015. A graph that disaggregated GHG emissions according to income category was therefore removed from the summary. It had shown that there was a steep rise in emissions from upper-middle-income countries compared to the other economic groups between 2000 and 2010—this is what drove the steep global rise in that decade—and that emissions from upper-middle-income countries nearly drew even with emissions from high-income countries by 2010. As collateral damage, a companion graph that disaggregated per-capita GHG emissions according to income category was also removed. It had shown that median per-capita emissions in high-income countries are still substantially higher than those in upper-middle-income countries and are nine times higher than those in low-income countries—13 versus 1.4 metric tonnes CO2-equivalent per capita. As economic growth is an important driver of emissions, higher incomes indicate both causal responsibility for climate change and financial capacity to transition toward a low-carbon economy. Income-based country groupings are therefore relevant for determining responsibility for mitigation efforts. The removed graph on total GHG emissions by income category, for example, may suggest that ambitious mitigation targets are appropriate for China and other emerging economies, and the removed graph on per-capita GHG emissions by income category may suggest that ambitious mitigation targets are appropriate for the United States, other Annex I countries, and fossil-fuel-rich Gulf countries. 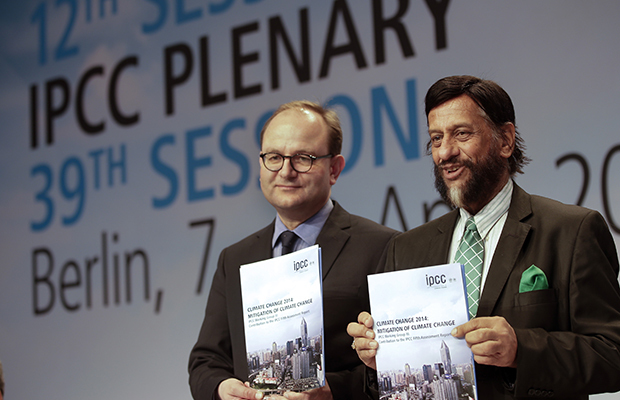 Parties to the convention must work toward an agreement in 2015 that will bring about the massive reduction in emissions that the IPCC report finds is necessary for climate safety. The dichotomy between the annexes is outdated and insufficiently nuanced to define appropriate mitigation contributions, and concealing relevant data for the sake of short-term national interest will amount to longer-term national and global harm if it results in less mitigation. Developed and developing country parties should therefore begin a transparent discussion of emissions—historical and current, total and per capita—development needs, and wealth. Gwynne Taraska is the research director and interim director of the Institute for Philosophy and Public Policy at George Mason University and a Visiting Researcher at the Center for American Progress.